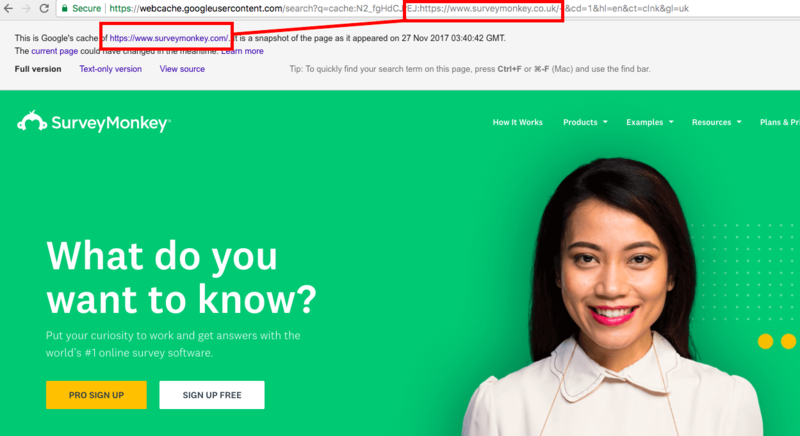 ccTLD’s Not the Preferred Way to Localize for Google? In 2015 Google’s John Mueller published on Google’s Webmaster Blog that Google uses county code top top level domains (ccTLD) to determine the location targeting of a country. Q: What about real ccTLDs (country code top-level domains) : will Google favor ccTLDs (like .uk, .ae, etc.) as a local domain for people searching in those countries? A: By default, most ccTLDs (with exceptions) result in Google using these to geotarget the website; it tells us that the website is probably more relevant in the appropriate country. Again, see our help center for more information on multi-regional and multilingual sites. According to this, websites with a country specific domain extension like .ca for Canada or .co.uk for the UK should not need any additional directives like Hreflang to inform Google of their country targeting. 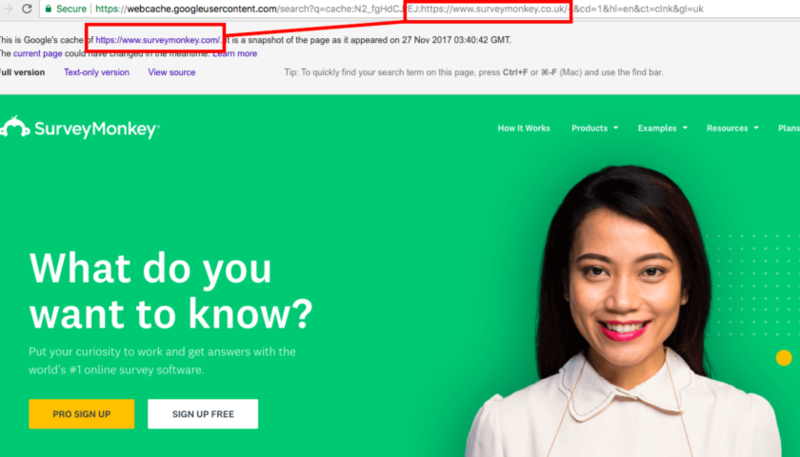 In fact any website with a ccTLD automatically has location targeting set in Google Search Console to that specific county and it cannot be changed. 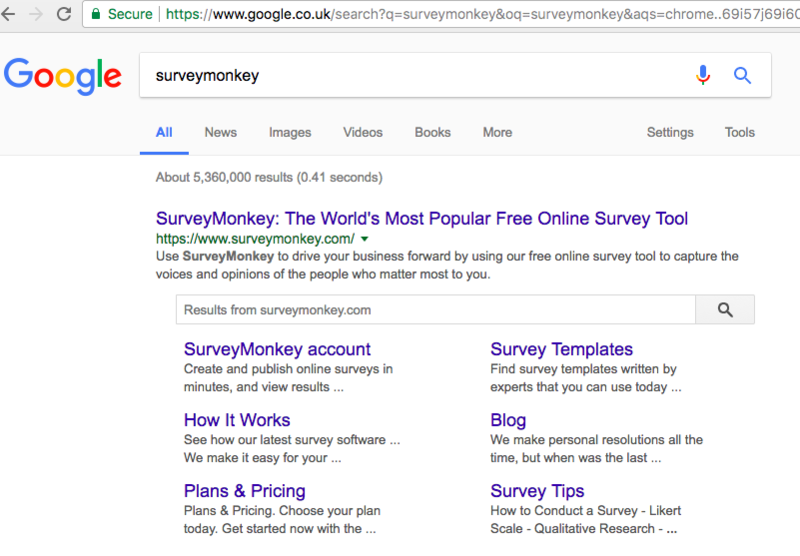 Based on this, I reached out to John Mueller on Twitter to understand why Google would rank SurveyMonkey’s generic SurveyMonkey.com instead of our UK domain www.surveymonkey.co.uk for searches for our brand in the UK. It would seem that for especially brand searches the .co.uk would be the correct result for UK users even if the content was duplicate (the homepage is a replica of our .com). John Mueller’s response indicates that his advice from 2015 no longer stands. If content is duplicate it will be folded into the results of the another version (and I assume this will be whatever they consider to be the stronger version). That can happen when we fold the versions together (usually if it’s the same content). Having unique content & hreflang links help. Since local traffic isn’t certain, I’d also consider a subtle banner when you spot people from the wrong “locale”. His response aligns with what I had noticed in Google’s cache of the SurveyMonkey.co.uk homepage which shows the .com homepage as the cache for .co.uk. 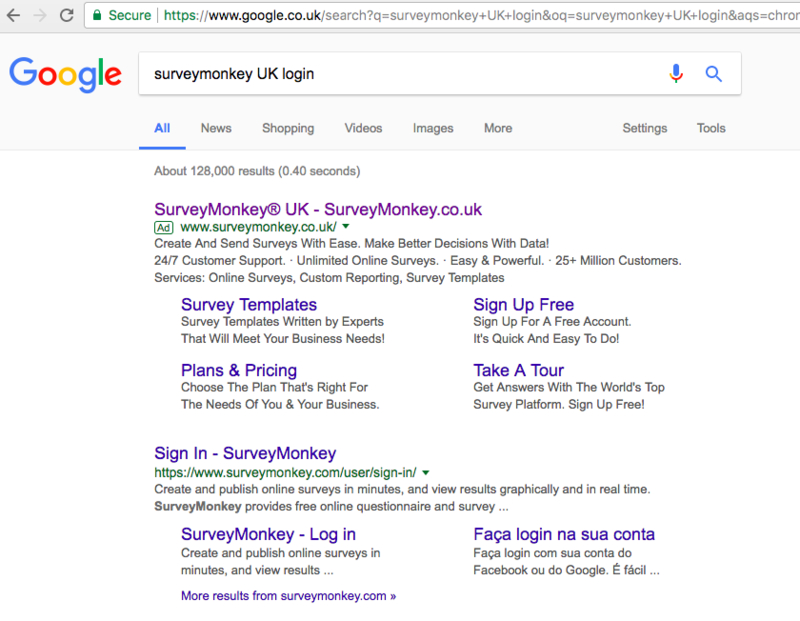 As an aside, the co.uk homepage result can only be found by specifically searching for surveymonkey.co.uk in Google which means that the page likely has been dispatched to the supplemental results as duplicate content. If this is correct, why should anyone even consider a local approach with the use of ccTLD’s. As anyone who has ever gone down the road of creating ccTLD’s knows, this is a very expensive and technically complex process. Therefore, using ccTLD’s for international SEO should likely only be considered when the content is different enough that Google will not fold the versions together. Essentially this means that websites that cater to multiple English audiences should never consider duplicating their domains for any other English speaking countries like the UK, Australia, Canada, New Zealand and other smaller primarily English speaking countries just to increase relevancy and clickthrough rates for local users. I am in Canada visiting our Ottawa office this week, and my co-worker Sean O’Dacre pointed out to me that he frequently notices this ccTLD issue when searching on Google.ca from Canada for products sold on Amazon. I replicated this very easily by conducting a search for Kuerig Amazon. Notice that the first result is for the Kuerig category page on Amazon.com (https://www.amazon.com/Keurig/pages/2594742011) which links out to Kuerig products on Amazon.com with pricing in USD. 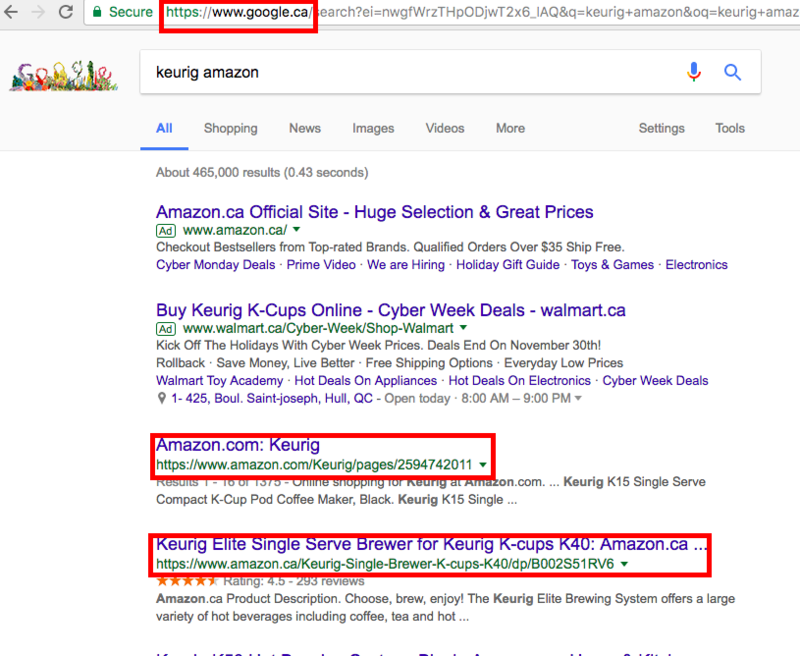 Google should be ranking the Canadian Keurig category page (https://www.amazon.ca/slp/keurig-coffee-machine/m3u7h79whnks9sb) with products that can be shipped to Canada and prices in Canadian Dollars. In this case, it isn’t just an SEO issue as it crosses into user/searcher experience too. If you have seen something similar, I would love to hear your thoughts!